High quality ELOs include eight elements, consisting of four key features and four learning components. The ELO Design Template is a tool to help you build ELOs that include all eight elements. 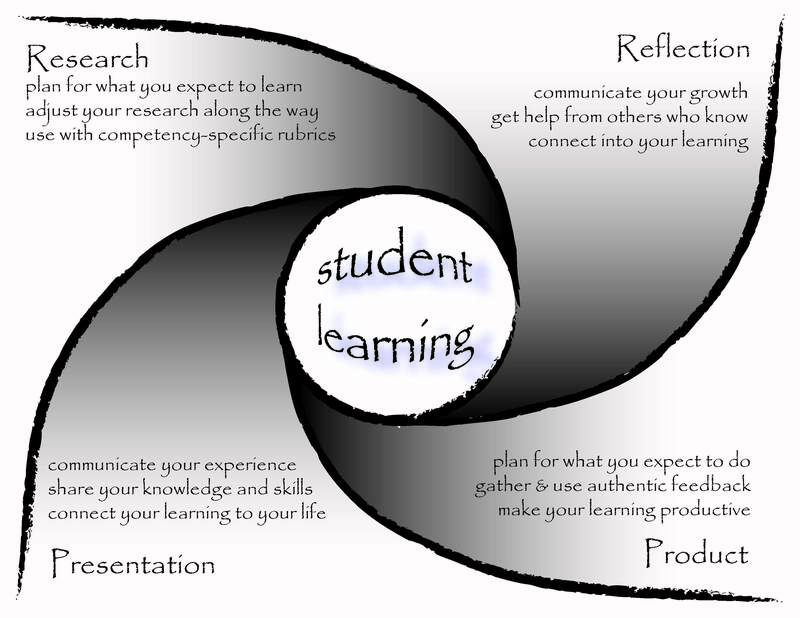 The learning in high quality ELOs that takes place outside the traditional classroom. However, ELOs can also be done within the school building – the school itself may be the community. Community partners take the learning outside of school. Through them, students engage in meaningful learning that contributes back to the larger community. Understand the NH Department of Labor rules around work-based learning. Competencies are clear criteria that guide students’ learning and translate the learning into credit towards graduation. A competency map is a good tool to show the connection between ELO activities and the competencies the student is working to master. ELOs may cross multiple content areas since competencies lend themselves to interdisciplinary thinking. See samples of interdisciplinary ELOs on this site. provide a baseline for the student to refine his or her own answer throughout the ELO experience. Explore Buck Institute for Education (BIE) for project ideas. The Buck Institute supports teachers to use Project Based Learning, which they define as a teaching method in which students gain knowledge and skills by working for an extended period of time to investigate and respond to a complex question, problem, or challenge. create new meaning and knowledge. Research: Plan what you expect to learn. Adjust your research along the way. Use competency-specific rubrics. Reflection: Communicate your growth. Get help from others who know. Connect into your learning. Product: Plan what you expect to do. Gather and use authentic feedback. Make your learning authentic. Presentation: Communicate your experience. Share your knowledge and skills. Connect your learning to your life. The design template is a useful tool for developing high quality ELOs. It was originally created by the Q.E.D. Foundation as part of the NH Department of Education ELO Initiative. Schools around the state have used this document as a starting point for creating design templates customized for their local needs. We invite you to adopt and adapt the design template freely! Your design process may vary. For example, an ELO may be initiated by a student and teacher, and then other team members are added, or a teacher and community partner may initiate an ELO to propose to a group of students. Schools may develop an agreement form that outlines a consistent process to ensure the quality of the ELO designs. An ELO team is a collaboration of people with clear roles and responsibilities. 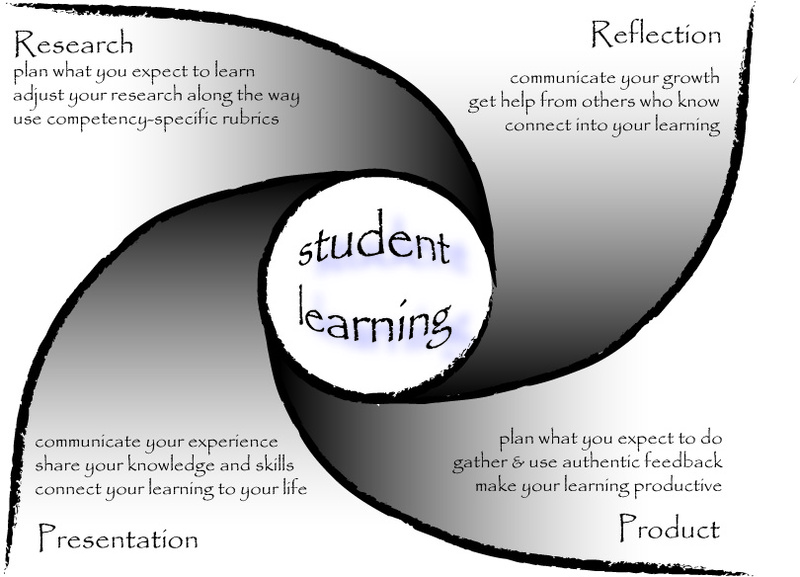 Student involvement in all aspects of the experience is critical, including developing their ELO plan, learning goals, and assessment of their learning. Student success is linked to parent/guardian involvement and encouragment throughout the ELO process. Roles and Responsibilities in ELO Assessment (PDF, 1 page, 2011) contains most of the information on this page. You may be close to doing ELOs at your school without realizing it. With minor changes, common academic structures and activities can grow into high quality ELOs. The Almost ELO chart (PDF, 1 page, 2018) lists activities that meet the state definition of ELOs (Section 306.27 (b) of the NH Minimum Standards for School Approval), and shows what you would add to turn them into high quality ELOs. For example, a senior project might just need an essential question and a final presentation. An internship might need an essential question, research, reflection and a product. It depends on how your school currently sets up these activities. MSWord version of Almost ELO Chart. Feel free to customize for your school using our blank Almost ELO chart. Example: a summer career exploration program at Keene State College, ACES, was turned into an ELO structure with just a few hours work with the ELO Design Template. The planners had to connect to specific competencies, tighten up the reflection process, and ask the program director to write student narratives. 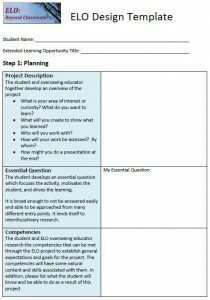 Download the ELO Design Template and the four-page NH DOE resource, “What is a Good ELO?” that provides detailed explanations of research, reflection, product and presentation. Fill out the design template. Your work to answer the template questions will show you what you need to tweak. Try it out with somebody! 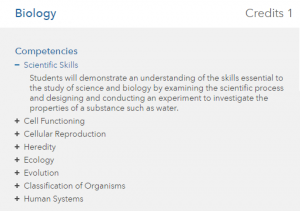 Biology competency list from VLACS. The NH Dept of Education has a page, State Model Competencies, which has links to approved competencies in English Language Arts, Math, Science, Arts, and Work Study practices. VLACS (Virtual Learning Academy Charter School) has open source competencies for all their high school and middle school courses, available for anyone to use. VLACS is an approved New Hampshire high school, so the competencies may match up well with the courses in your schools. To see competencies for each course, go the VLACS Learning Catalog and click on the course name. Click on a specific competency to see the full description. VLACS Learning Pathways (PDF, 45 slides, 2016) is a PowerPoint presentation that gives an overview of competencies and a competency-based approach to dividing course credit between classroom learning and ELO learning. CompetencyWorks is an online resource to provide information and knowledge about competency education. It has a blog filled with practitioner knowledge and policy advancements, and a wiki to make it easy to get examples of materials. The Art and Science of Designing Competencies by Chris Sturgis is a 16-page Issue Brief that brings together insights from a number of leading practitioners from around the country. A companion resource to The Art and Science of Designing Competencies is the Competency-Based Pathways Wiki. ELOs can be available to any student in any subject. There are specific considerations to take into account for a student with an IEP or Section 504 plan. include clear competencies based on curriculum expectations, related skills, and the postsecondary and annual goals from the student’s Individual Education Plan (IEP). take into account student interests, needs, and aspirations that may not be reflected in the IEP. be attainable in a logistical sense – designed so that transportation, time commitments, and coaching opportunities are all realistic for the student. take into account the student’s accommodations as outlined in the IEP. ELOs can also be referenced in a student’s course of study (educational plan) or as a transition activity in the context of the coordinated set of activities. See the Next Steps NH IEP Transition Requirements Resource for more information about the IEP transition requirements and Indicator 13. Students with Section 504 plans do not have IEPs, but their Section 504 plans will specify accommodations and modifications to ensure equal access to an education. When planning the ELO, incorporate the student’s accommodations and modifications into the ELO design from the beginning. When planning the summative assessment, build in supports so that students can display their knowledge in a way that is accessible and meaningful for them and stresses their communication strengths.